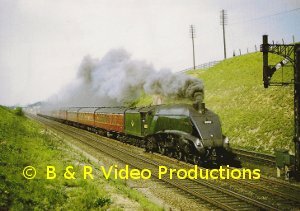 The third in our series of films on the East Coast mainline and others in the 1960′s. 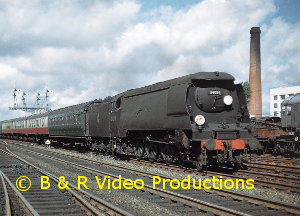 This film begins with extensive coverage of PETERBOROUGH station in 1963 just before through steam services to London, were due to cease. 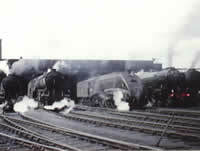 All four classes of Pacific are seen with V1 and B1 back-up. Move on to SPALDING, a crossroad for railways, with much steam hauled traffic in 1963 with B1s, 9Fs, WDs and V2 motive power. The journey travels via DONCASTER and LEEDS from where a B16 took a rail-tour to BOROUGHBRIDGE and MIDDLETON with a V3 in attendance. The WAKEFIELD area and FRYSTON colliery and then on to SCARBOROUGH and Whitby on a rail-tour with 3442, before steam at YORK. 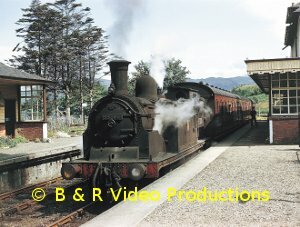 The NEWCASTLE area had plenty of steam, serving the coalfields before heading north to BERWICK and finally a tribute to the A4 Class north of the border, showing nine of this class making a total of 14 A4s in this film. 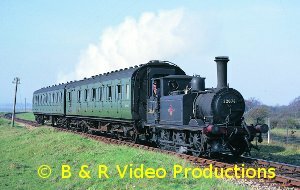 There are over 100 recognisable locomotives on this film of mainly ex-LNER motive power. A few industrial engines add interest and even a few early built Deltics appear.